It’s not that I wasn’t entertained by The Surrogates. As a matter of fact, it’s often very genuinely difficult to not be entertained by Bruce Willis, or by a future involving robots. These, however, are not innovations of the film, and any innovation that actually does happen is down to the source, not the movie. The basic premise is certainly not without its merits. Surrogates, robots which people control remotely in order to leave their homes safely, as well as always looking their best, have become the norm. There are some colonies of “dreads”, lead by The Prophet; but these people, who refuse the use of surrogates, are widely marginalized and discredited. All seems well and good, till a weapon appears seemingly out of nowhere, which allows a person to kill an operator of a surrogate through interaction with the robot. No one knows how this is possible, and an FBI agent played by (who else?) Bruce Willis is sent out to figure out what, exactly, is at hand here. He turns out not to be too keen on the buffered human interaction provided by the surrogates, having realized that they allow people to pretend to be something they are not, or block out the world entirely by living in proxy. He therefore resolves to go out in person for the first time in years, and uncover the massive conspiracy. You know the kind – everyone is shocked, except for the audience members. Granted, Jonathan Mostow, the director of the film, knew what he was doing. Also known for the third film in The Terminator franchise, he directed the mechanical beings with confidence. 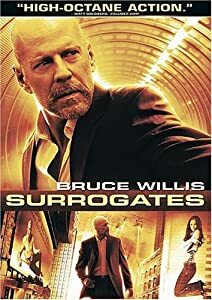 Even so, some of the acting was amazingly more wooden in The Surrogates than it was in T3. This may, however, be due to the fact that we don’t expect emotions from Arnold Schwarznegger, whereas this movie can’t seem to make up its mind on whether or not these robots are capable of showing feeling. It is not the case that the acting is consistently weak, however. Rosamund Pike, who plays Agent Greer’s wife, believably portrays shutting herself off after a personal tragedy. Bruce Willis allows some emotions to come through in his non-robot mode. The majority of the characters, however, was painfully underdeveloped in the script stage. This, coupled with some gaping plot holes, makes for a film that is average, at best. Finally, a word to the wise aimed at the writers/producers of the film. If you’ve cast Bruce Willis as a lead in your film, don’t have a different actor play his character in the climax. That just seems like a bad decision, right? A word of warning for would-be cinema-goers: here, there be monsters. I’m not talking about clinched Hollywood CGI monsters (though Looper contains plenty of innovative special effects). I mean human monsters, casually and unfeelingly taking the lives of others. This palpable atmosphere of violence permeates the entire film, the populace of Kansas City in year 2044 having grown harsher, more callous. Those beneath a certain social/economic stratum are disregarded entirely. The average citizen (or perhaps merely those characters we happen to encounter during the film’s 118 minute runtime) seems to be entirely unconcerned with the concept of, for example, hitting somebody with a car, or shooting a vagrant that wanders into their property. Granted, the context of the movie is that of brutal mafia-bosses and their hired assassins, but the openness with which they operate is beyond shocking. It occurs to me now that Looper appears to have a complete lack of police presence of any sort, which may explain the rest of the backdrop. Putting the ugly vibe aside, Looper is completely thrilling, and certainly swings for the fences consistently, not satisfied with coasting on an interesting premise as Bruce Willis’ 2009 disappointment of a movie Surrogates did. Then again, neither is he the focus of the movie; Joseph Gordon-Levitt’s character completely and utterly in charge of every scene, channeling perfectly the swagger of young Bruce Willis. His own performance is considerably more tempered – with some reason, considering he plays a hitman in retirement. Both actors, of course, play Joe, a Looper, whose job is executing people sent to be disposed of from the future. When the future iteration of the crime organization Joe works for begins sending back the older versions of the loopers themselves to be disposed of, the young Joe becomes concerned. His fears are realized, when arriving at the location of his next murder, he is confronted with his older self. His moment of hesitation gives his future self time to escape the scene, leaving Joe in a disastrous position. The mafia is, naturally, displeased, and looks to dispose of both of the iterations of their former employee. As Joe seeks refuge with Emily Blunt’s character Sara, a single mother living on a farm, the young family’s seemingly idyllic, though simultaneously twisted lives are thrown into disarray too. The performances in the film are great across the board. The before-mentioned actors all do their jobs, which is a tall order on its own. Even the supporting cast, however, shine in their scenes – Paul Dano, who has played to my mind exclusively likable characters in the past, is perfectly despicable throughout. Jeff Daniels as the boss is, as any terrifying father figure must be, simultaneously instantly amiable, and bone-chillingly cruel. Even the young Pierce Gagnon shows surprising range at the age of 5. All this is also in large part to the credit of writer-director Rian Johnson. The largely independent filmmaker’s writing really shines in the dialogue, as well as in concisely stating his overarching themes both through words and visuals. The director has stated numerous times that the movie is about the notion of fixing a problem by finding the right person and killing them. Johnson unflinchingly takes us through to the logical outcome of both a character who has based his life around that policy, and the culture which in the movie seems to have adopted the idea wholeheartedly. Violence, of course, begets more violence, and some of the parts of the movie are beyond shocking (a certain scene of retroactive mutilation is particularly hard to shake). If you are a fan of innovative science-fiction which is about something more than special effects, while simultaneously being completely thrilling, see Looper at once. Consider yourselves warned, however – if you are the type of person who cannot stand movie violence and simply would prefer to keep that out of their world, hey, it’s ok. We understand. Just be prepared to not understand half of what the rest of us talk about for the rest of the year. The concept behind Unbreakable is brilliant, as is so often the case with M. Night Shyamalan films, whereas the execution is so mediocre it’s tough to believe. Shyamalan seems to fall into that distinctive decade of films in the 90s where movies where striving for realism and grittiness in their looks. Most of the time, however, they were simply dark, bleak, and uninteresting to look at. It’s disappointing that probably the most unique take on the superhero genre in cinema falls so flat due to stylistic choices. It’s hard to believe that it would not have looked dated even in 2000, when it came out. 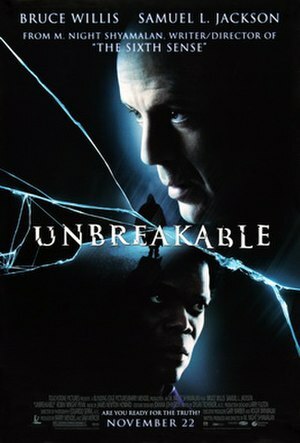 Unbreakable is set against the background of comics, as evidenced by statistics of comic book readership during the opening of the film. All this is interesting, and indeed some of the dialogue about comics and their tropes is very enjoyable (and falls well in a great tradition of comic book dialogue in movies). This can only serve to appease comic book fans, however. Mr Glass’s character’s obsession with comics will be misunderstood by most viewers, and the fact that the film itself treats it as psychopathic is unfortunate. Bruce Willis plays David Dunn, a man who miraculously survives a train crash without a mark on him. It is then that he is approached by the owner of a comic book art gallery, portrayed Mr. Price, otherwise know as Mr. Glass, portrayed by Samuel L. Jackson. He, after a life-long search for a real superhero, becomes convinced that he has found him in Willis’s character, who for the most part want nothing to do with it. The majority of the film, therefore, concerns the skeptical Dunn going back and forth on his superhumanity. As a study of a genre, the film definitely has strong points. Unfortunately, it simply fails as good cinema. To those familiar with Wes Anderson’s previous work, it’ll come as no surprise that Moonrise Kingdom, his latest opus, is one of the most uplifting films of the year. To be fair, it also doesn’t deviate from the style we have to come to accept as unique to Anderson, but the demeanor of his films is so unique among his contemporaries that it’s my opinion that Anderson making a film which was radically different from his other work would mark the loss of a singular voice in cinema. 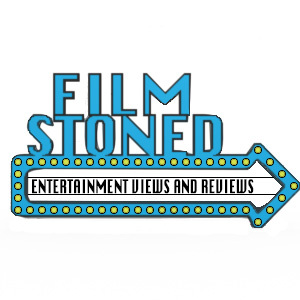 As such, Moonrise Kingdom is doubtful to convert those unimpressed by the ‘typical’ fare offered by the filmmaker, but those that count themselves among Anderson’s fans, or are simply unfamiliar with his work, owe it to themselves to see Moonrise Kingdom. The film begins with the mysterious elopement, in the summer of 1965, mere three days before a cataclysmic storm, of twelve-year-old Sam Shakusky from a scout camp on the fictional island of New Penzance. Scout Master Ward, portrayed with genuine sensitivity and concern by Edward Norton, springs to action hoping to find young Sam (Jared Gilman, a first time actor that we are sure to hear from again soon) before he hurts himself. He is assisted in this task Bruce Willis’ character Captain Sharp, the only police officer on the island. One of the other characters aptly describes Captain as being “kind of sad”, and it’s tough to argue that point, but that makes him Willis’ most approachable character in at least five years. As the film’s focus switches, quite quickly, to Sam’s journey, it becomes apparent that the purpose of his escapade is to meet with, and run away with, Suzy Bishop, played by Kara Hayword, another talented young actress. The two young lovers escape to a small inlet, where they quickly set up a child-sized, yet remarkably emotionally mature, paradise. In the meantime, Scout Master Ward and Captain Sharp find out that Sam is an orphan, and is about to thrown out of his foster home. While the two runaways are inevitably tracked down, and are forced to flee again, and the situation becomes dire for indeed for many of the characters, the film never becomes bleak. Through the cinematography, camera movements, music, and overall stylization of the movie, which are simultaneously stock for Anderson and a delight to behold every time, we are brought into a world which doesn’t exist any longer, and indeed may never have. Anderson, himself born in 1969, evidently feels a sense of nostalgia for a time he doesn’t himself remember, a sentiment whose mere acknowledgment in other people tends to put me personally at ease. The film is narrated by Bob Balaban in a style reminiscent of old travel documentaries, a genre already heavily borrowed from by Anderson in his film The Life Aquatic with Steve Zissou. The rest of Anderson’s usual cast, naturally, is also there – Jason Schwartzman makes an appearance as a surprisingly willing assistant in the young couple’s escape, going so far as to marry the two twelve-year-olds. Bill Murray find in the role of Suzy’s father one of his most unlikable characters, justified though his actions may be. The notable difference in this movie is the absence of the last name Wilson in the cast credits (Luke and Owen Wilsons being among Anderson’s most common collaborators). Overall, the tone of the film leaves one walking out of the cinema ready to fall in love, adopt an intelligent and sensitive orphan, and help facilitate his own budding romance. The reality portrayed on the screen is idealized, yes, and we’re aware that outside the immediate bounds of the shot, everything may not be as beautiful or ideal – after all, there are hints of death, bullying, and genuine depression in this film. The filmmaker, however, chooses to dwell on a release from those self-destructive impulses, and instead give us a glimmer of hope towards something brighter – perhaps in the form of the marriage, however unusual, of two twelve-year-olds.